It is often very difficult to precisely attribute a flag to the place and name of an actual manufacturer, especially if the flag does not have a maker's mark or some other solid documentation accompanying it. In some rare circumstances, however, a consistencies in the construction and design of a flag might allow a reasonably reliable attribution. Such is the case for this flag. There are perhaps half a dozen flags of this precise star pattern, star count, size and construction which have surfaced and are known today. One such flag was attributed through research and documentation to the company of Mr. Jabez W. Loane, a Baltimore, Maryland manufacturer of flags and militaria. Certain very specific attributes of this flag makes it almost certainly a sibling of the other Jabez Loane flags. First and foremost, it is in the exact same pattern and of precisely the same size, to the inch, as the other known examples. One particular consistent trait of all known examples, which is especially beautiful, is the precise alignment of the stars, such that the "head" arm of each star points directly toward the center, and the upper "arms" of the star are perfectly aligned tip to tip with the arms of its neighbors. The wreaths of stars are in perfect circles, the medallion is precisely centered on the field, and the number of stars in the wreaths are exactly the same as in other known examples attributed to Loane. The 35 stars of the flag place its manufacture squarely in the Civil War years, and its attractive wear, aged toning and relatively small size, make it a rare flag of the highest caliber and well deserving of its place in the Rare Flags Showcase. 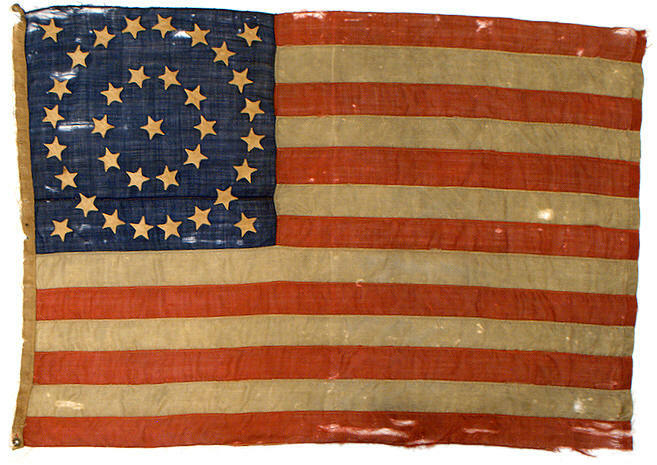 The flag descended in the Arntz family of Slinger, Wisconsin. For many years, it was kept in a cardboard box labeled Arlington Shower Curtains. 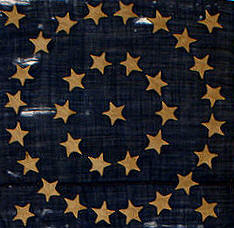 Accompanying the flag is an early hand written note that says "Done Service in Civil War 1861-1865 Note Formation of Stars". The note is written on stationary from Wm. F. Bindrich Furs, Milwaukee, Wisconsin. An early carbon copy of this note was also included. Verbal provenance of the Arntz family is that the flag was actually carried in the Civil War, but an original letter written by Mr. Edward Arntz' grandmother that at one time accompanied the flag was lost by one of the children during a school show-and-tell many years ago. Learn more about Civil War flags.